Convenient parking is available for Sam Houston Park. View the map shown for more information on all parking options, including rates, hours of operations, and entrances. 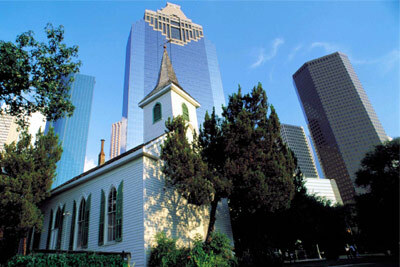 Sam Houston Park is Houston's first established park that was created in 1900 by former Mayor Sam Brashear. The park is located at the edge of town on a 20-acre property that once belonged to the Kellum-Noble House and School. The park is landscaped as a Victorian-style village, with footpaths, streams, a rustic bridge, and an old mill. Under the operation of the Heritage Society, many historic structures were relocated to the park, which is now home to the Kellum-Noble House, Nichols-Rice-Cherry House, San Felipe House, Pillot House, St. John Church, The Old Place, Straiti House, Yates House, 4th Ward Cottage, and Baker Family Playhouse.